6. Alien registration number or A-number is only available to DACA approved DREAMers or those with other pending immigration petitions (e.g. you maybe in the US illegally but might have a pending green card application and that would give you a valid A# and you should write it down in the space provided). 7. US Social Security Number: If you received a valid SSN at any point either after DACA approval or prior (for whatever legal status you have), enter it here. DO NOT write down your fake/fraudulent/stolen/made-up SS# (or even if someone is letting you use their valid number). 8. 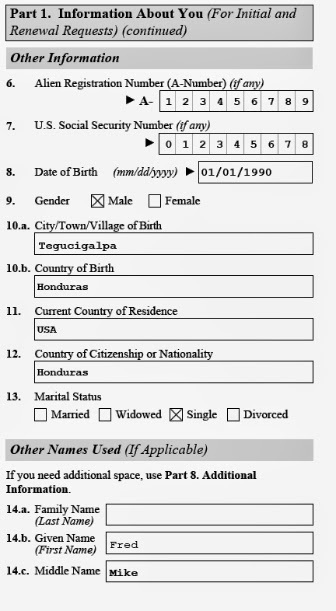 Enter the DOB exactly as it appears on your passport and/or birth certificate. 9. Gender: Check the appropriate box. 10a. Write down the place of birth from your birth certificate. 10b. Country of birth regardless of the passport that you currently have. 11. Current country of residence. There is only correct answer and that is USA. Even if you are living illegally in the United States (or DACA approved DREAMers who have no legal status, only a deferral of deportation for two years), for the purpose of this question, you must say the United States of America, because that is where your primary residence is. 12. Country of citizenship or nationality is the one whose passport you carry. If you have more than one nationalities, mention the one that you would like to use in the future or have valid passport. 13. Marital status: Check the correct box. 14. Other names used: If you had a maiden name because you are now married, you must enter it here. If you have used nicknames, for example, our hypothetical man in this case, Fernando Miguel, tried to fit in by using names like Fred or Mike, they should also be entered, as long as they were used widely (if the name was merely used within your family, there is no reason to disclose it).